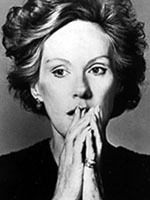 Tammy Grimes had a successful Broadway career and appeared in 27 episodes of CBS Radio Mystery Theater as host in the show's last season. She starred in 27 RMT episodes, including the 5-night Nefertiti epic that premiered in 1979, before taking over as series host for a badly ailing E.G. Marshall in 1982. Besides Nefertiti, a favorite Grimes episode was "The God Killer" from 1976, in which she played a creepy murderess. Ms. Grimes's daughter, Amanda Plummer, made five RMT appearances, including the last two installments of the 1982 Les Misérables adaptation. Ms. Plummer also had the lead in "To Be an Empress," the second-to-last RMT episode before her mother took over as host. 05/09/1974 0089 A Tiny Drop of Poison A charming politician hides her dark part as a hippie radical and a murderer. But her game seems up as her husband is allocated the responsibility of cracking the case. 02/27/1976 0439 Half a Life What do you get when you mix bar, a handsome stranger, and a lonely middle-aged woman? True love? Or is it just another recipe for disaster? 10/12/1976 0534 The God Killer A typist is accused of murdering the author for whom she works. She insists that the murderer was a character from a novel fighting for his survival. 12/17/1976 0567 A Quiet Evening at Home A woman goes to a train station to meet her lover so they can leave their spouses. But when she witnesses a murder, her lover leaves her and she fears testifying because her husband will find out. 10/10/1977 0722 The Actress The quintessential story of an actress slowly losing her own self in the life of the tragic character she is supposed to enact. 06/27/1979 0992 The Giuseppe Verdi Autobus While on vacation in Italy, a widow falls for a vacationing widower from L.A. Problems arise when she discovers that he has not been honest with her as she packs his belongings in preparation for their trip back to the U.S. I always try to say nice things about everybody and everything. However, I do not like this woman. When she replaced E.G. Marshall, I gave her a chance, but her whispery, pseudo British voice is annoying. Sometimes I simply cannot hear her. However, on a positive note, when she introduced The Way Station, she did get us ready for a spooky tale. She did sound quite passionate and dedicated to that story. That, I enjoyed. Otherwise, she simply did not hold my interest in anything else she did. How does everyone else feel about her? I'm with you completely, Robert. I'm convinced that Christopher Plummer must have woken up one day and screamed, "Shut up! Shut up!!" before they divorced. She's a talented actress, but not the most compelling actress. Her best work here, I believe, is the "Nefertiti" multi-part saga, and that's because she had great chemistry with Russell Horton. She worked well with Lloyd Battista, too. But whenever she starts screaming, wailing (as in "Sleepwalker"), cackling, or arguing loudly, I lunge for the volume control. In my year long journey of listening to all of the Mystery Theater episodes I'm now entering into the Tammy Grimes era (#1284). The end is well within reach by the end of the year. Come on, anyone having the misfortune of replacing E.G. is going to have an uphill battle. In fairness, she got the job when others didn't. Why? Because she was a class act and total professional dedicated to her craft. It's obvious to anyone listening that she's articulate and a cut above the norm (or several). The listener was never bored when listening to her. Also a very short TV run. The Tammy Grimes Show was one of the first that I remember as a kid that was pulled after airing only once. I never new she was the original Molly Brown! I only new it as Debby Reynolds roll! She certainly had a distinguished career, however, I could never quite understand why she was chosen to host that final year. In general, I think it was a mistake to involve so many theater actors with the show. No doubt many were very good, but I think there is a tendency for actors in plays to "overact." It would have been interesting to see how the show might have been different had it been based on the west coast, utilizing actors used to performing on TV and in the movies. Not complaining about the show as it was, but just engaging in some conjecture. I don't know why so many people have such a problem with Tammy Grimes' voice. I think she has a very nice, soft, soothing voice and she did an excellent job as host of CBSRMT. I always thought she introduced each episode very well. I also enjoy E.G. Marshall as well, so I am saying that I like them both. Why does it have to be one or the other? I began listening to CBSRMT in 1979, so I had fairly equal exposure to both hosts. While I enjoyed Marshall's evocation of classic radio program hosts (I was obsessed with the music, radio and films of the thirties and forties), I found Grimes' voice lent a more sinister, creepy quality to the narration. As a featured actress, however, I tend to agree with the more negative comments. Her voice was unique and immediately recognizable - but also totally phony. The combination of the three ruined her performances for me. In radio acting, the voice is everything. If an actor or actress's voice is the same for every character, it makes it very difficult for the listener to separate actor/actress from character and really lose him or herself in the story. In Grimes' case, it was always 'Tammy Grimes as ..' rather than 'So and So performed by Tammy Grimes'.